This week we are transitioning from our uni-lateral approach to the squat to introducing a bi-lateral approach to a jump progression. It is important to note that any well-rounded program should combine both bilateral exercises (split the resistance between two limbs) and unilateral exercises (stressing one limb) for maximum gains. I find this particular progression extremely useful, as learning proper jump mechanics and proficiency ensures maximum power-production and decreases the risk of injury and stress on your joints, especially as you move from body weight jumps to weighted jumps. 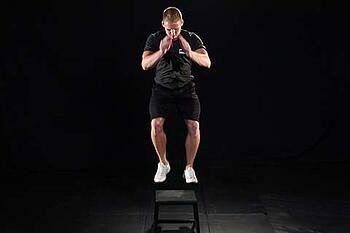 We like to start the bilateral jump progression with the Box Jump. Being the first step in the progression, we recommend starting with the box at mid-shin height. Ideally, use a soft box, such as a gymnastics box, instead of a metal box. The focus here is teaching the young athlete to land efficiently on a soft platform. Stand in front of the box with your feet hip-width apart. In a smooth movement, swing your arms back as you squat down to a 1/4 squat. At this point, without a pause, swing your arms forward as you extend from your ankles, through your kness and hips to jump onto the box. Land softly on the box with your feet hip-width apart, a slight bend in your knees and knees in-line - that is, not caving in toward each other. Do not land with your knees locked out. Stand up from this position. Step down slowly from the box. Reset at the start position, then repeat for the prescribed reps. Since this progression is being using for teaching purposes, these reps are not continuous reps, but rather single reps. At a later stage in the jump progression, it may be pertinent to work on continuous reps to enhance power endurance.